Load cells with welded-in thin-film sensors are designed for the measurement of static and dynamic pull and/or push forces in various applications. 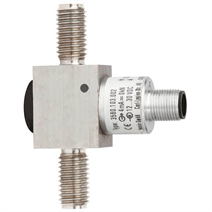 Load cells are suitable for tough operating requirements and harsh environmental conditions. They are maintenance-free and can also be mounted in hard-to-reach locations. Due to their small dimensions, operation in very small mounting spaces is also possible. Because of the variety of output signals, these load cells can be used in many application areas.